I don’t consider myself an innovator or early adapter in most areas of life, and that includes food, but I was beginning to feel like a Luddite by having this blog and a love for creative Asian flavors, and never having set foot in any of the Momofukus. 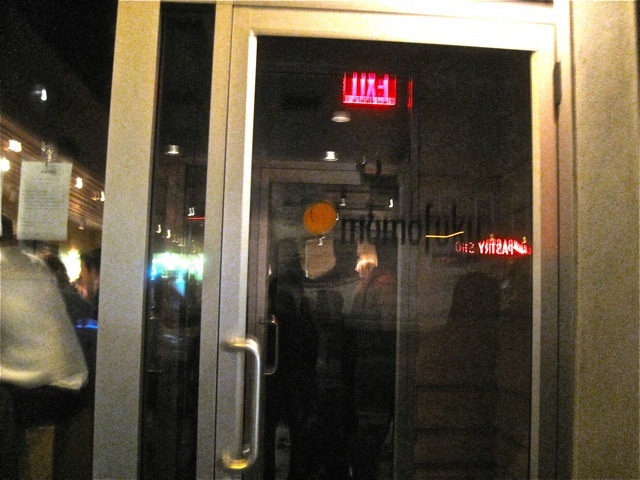 I have tried to dine at David Chang’s culinary empire, but have been thwarted by long lines and ridiculous reservation policies, so I just gave up for awhile. But an empty feeling has constantly nagged at me and has been intensified by the praises of others, “best Brussels sprouts ever…”, “pork buns to die for”, “Ko is a life-changing experience…” So I finally grabbed Spud, headed down to the Noodle Bar, and experienced things for myself. Well it did not disappoint, even with all the hype. The Noodle Bar has the sparse, clean, wooden decor typical of many sushi eateries. I love the open kitchen and next time I will sit at the bar so I can watch the chefs in action. 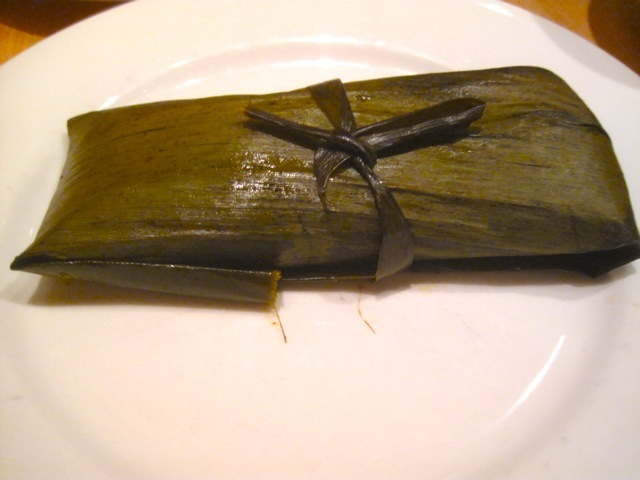 We started with a chicken tamale served in a traditional banana left. It was very good and I wanted many more. 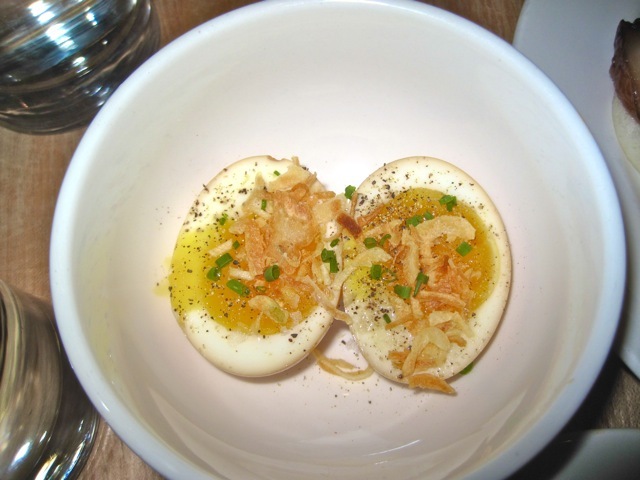 Next to a perfectly hard boiled egg split in half, topped with soy, scallions and bonito. 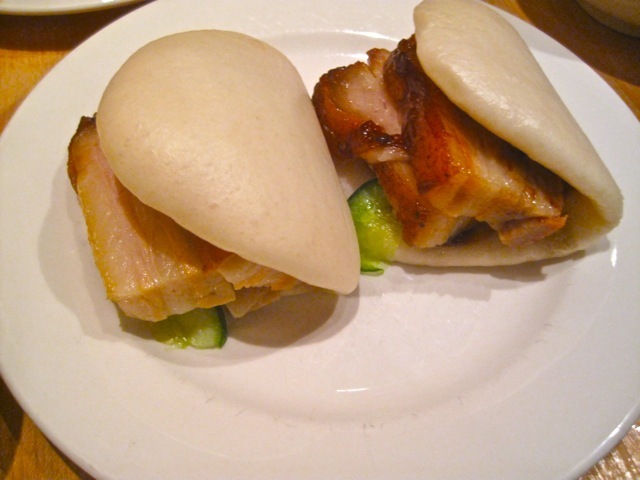 On to the signature pork buns, which had the perfectly squishy bun wrapped around fatty slices of pork. The fat was too much for Spud, but I enjoyed it, because it was actually really flavorful if you could get past the texture. 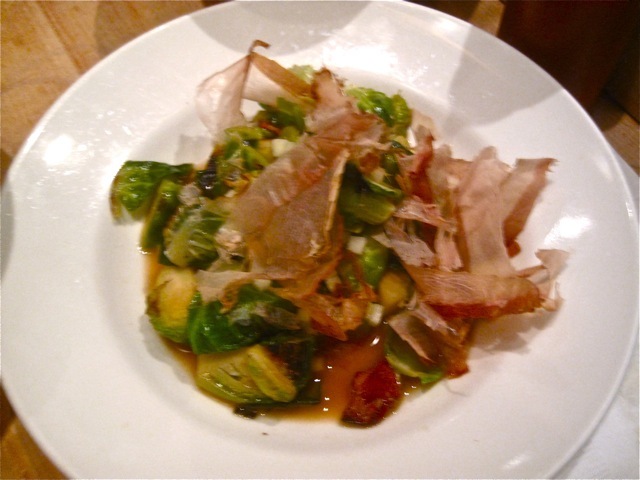 Next the Brussels sprout, which were roasted long enough to be tender with a nice charred flavor. The accompanying Benton bacon chunks were awesome and really made the dish. Finally, the noodles. 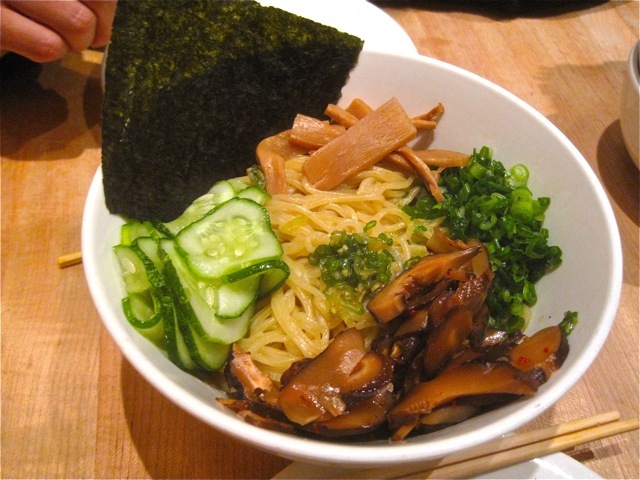 We were porked out and ordered the ginger scallion noodles with pickled shiitakes and cucumber. We weren’t expecting much, but these noodles were delicious! The texture had a perfect bite and were just slippery enough. The shiitakes added a meaty flavor the dish worked together so well. So now I am officially on the Chang bandwagon. My one criticism is excessive salt, but that is pretty much a given, especially with Asian flavors. But I love all the creative combination that push the envelope, but yet are comfort foods. It is amazing to eat a tamale, Brussels sprout and pork buns in the same meal and have it integrate so well together. I will definitely be back and I am anxious to try Ssam, Ko, Milk Bar and the Fried Chicken Dinner.